The U.S. EPA is seeking public comment on any aspect of the use of isobutanol in gasoline in response to a fuel registration application filed by Butamax Advanced Biofuels LLC. The public comment period ends April 30. The Massachusetts government has announced $450,000 in funding for the 2018 Commonwealth Woodstove Change-out Program, which provides rebates to homeowners two replace older, inefficient woodstoves with cleaner, EPA-certified wood and pellet stoves. Gevo Inc. released 2017 financial results on March 28, providing an overview of its financial status, production and sales, and market development activities. The company's Minnesota biorefinery is expected to focus on ethanol production in 2018. A Duke Energy power plant is using renewable natural gas from North Carolina-based hog farms to produce electricity—the first application of the technology from in-state farms. The project is expected to yield 11,000 megawatt-hours of electricity. 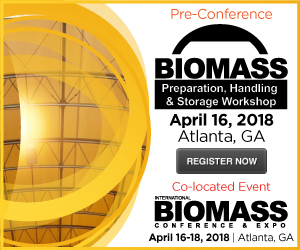 Veolia Energy Operating Services LLC, a division of Veolia North America, announced April 3 it was selected by Georgia Renewable Power to operate and maintain three biomass-to-energy facilities. Gevo Inc. announced April 2 that an ASTM International subcommittee has voted in favor of revising specification D7566 to include ethanol in addition to isobutanol and to increase the approved blend levels from 30 percent to 50 percent. Green Biologics Inc. announced that it has agreed to supply its patented GreenFlame biobased charcoal lighter fluid formulation exclusively to Kingsford Charcoal, to be marketed under a new brand: EcoLight. By studying and comparing the workhorse cellulose-degrading enzymes of two fungi, researchers from NREL have pinpointed regions on these enzymes that can be targeted via genetic engineering to help break down cellulose faster. Nippon Paper Industries Co. Ltd. held a completion ceremony March 16 for the biomass mixed combustion power generation facility at Ishinomaki Hibarino Power Plant, operated by Nippon Paper Ishinomaki Energy Center Ltd.
Albany and Saratoga County leaders announced an inter-municipal partnership on March 28 that allows for the establishment of a regional biosolid waste facility. The facility will recycle biosolids, sewer sludge and food waste into methane gas. Anellotech has announced a key operating milestone, achieving two weeks of continuous operation of its seven-story tall TCat-8 pilot plant, producing aromatics, primarily benzene, toluene, and xylenes, from loblolly pine feedstock. Technology company Protacon has purchased a substantial part of Inray Ltd, a Finnish company supplying X-ray technology based measurement systems to power and thermal plants, including those fueled by biomass. Researchers at Princeton University are using light to control genetically modified yeast and increase its output of commercially valuable chemicals. The results offer scientists a powerful new tool to probe and understand the inner working of cells.